I have been going through my visit to LEGOLAND Billund. While the LEGO Shop there was more than tempting, to keep the number of unfinished projects at bay I brought home only a few small souvenirs. The first memento I have already discussed, the second one comes now: a 852690 Designers’ Tool Set. 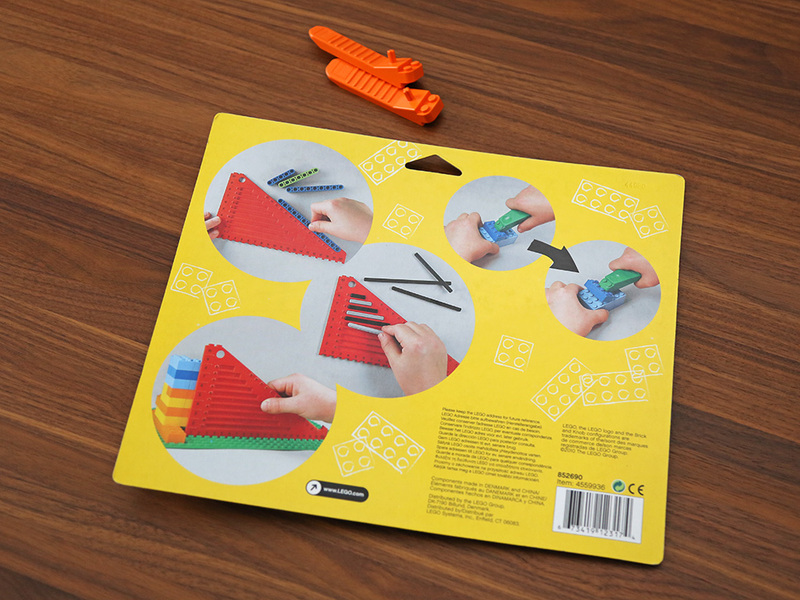 This is one of the few LEGO building tools I know of and it contains a green brick separator, the predecessor design to the newer orange 630 Brick Separator I reviewed earlier, and a red LEGO ruler. In addition to reviewing the set, I am comparing it with the orange brick separators that I bought earlier. 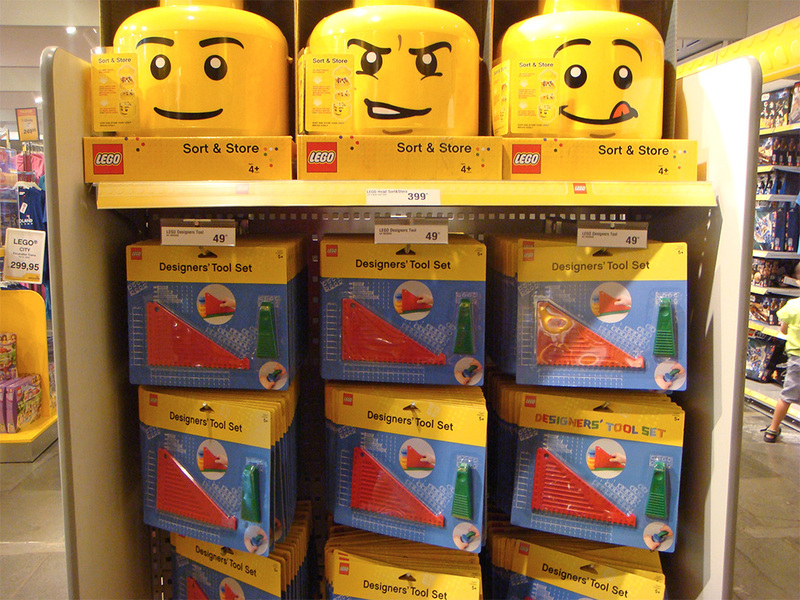 Above: Designers’ Tool Sets at LEGO Shop Billund. Note packaging differences. 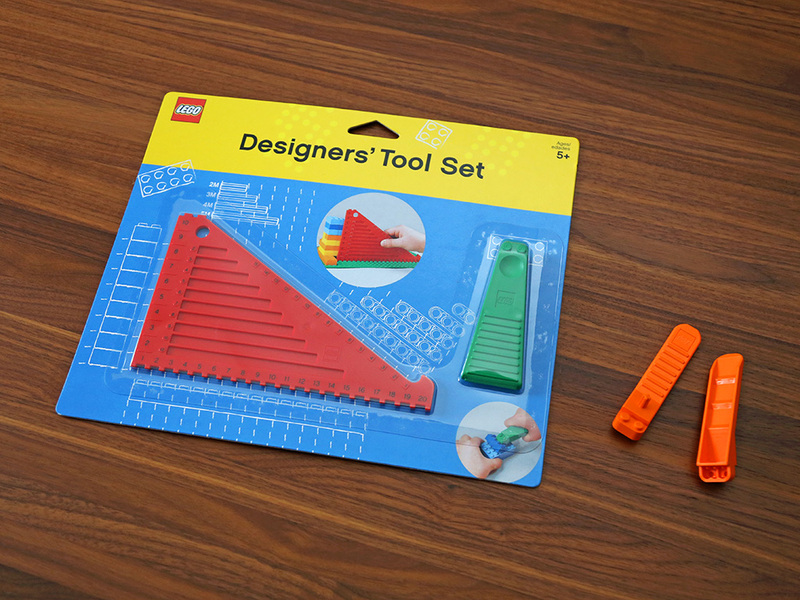 Released in 2009, the Designers’ Tool Set has two functions: separating stubborn LEGO bricks from plates and/or each other, as well as measuring the size of bricks and Technic axles. 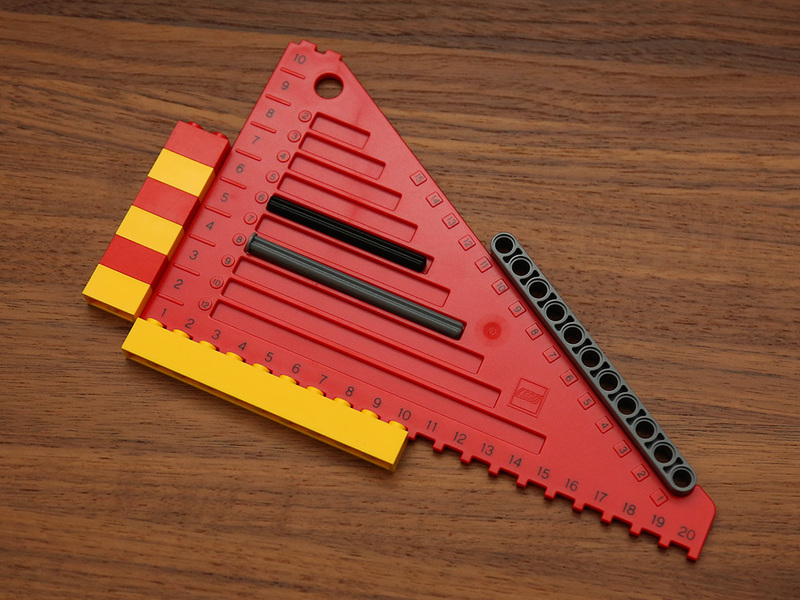 The latter is achieved with the red right-angled triangle ruler included, which can measure up to 20 studs length (bottom edge), 15 studless Technic beam length (hypotenuse, the top edge), 12 Technic axle length (inside the triangle) and 10 bricks height (left edge). The brick separation is done using the green brick separator tool. Both tools are good quality plastic and feel solid in hand, the separator being a bit classier than the ruler. Above: Designers’ Tool Set next to a couple of orange brick separators (sold separately). I must confess, I didn’t buy this set because I needed it. I already have plenty of brick separators and the ruler seemed – and still seems – a tad unnecessary. But the idea of having nice tools on hand when building appealed to me. Still, the red ruler is the less useful part of this set. While it may come in handy for younger children that can read numbers but count studs slowly, older people can usually determine the size of a brick or plate simply by glancing at it. I know I rarely count LEGO studs, usually I just know. And when needed, often counting is still faster than positioning the ruler. However, there are at least a couple of situations where the ruler feels useful. Measuring Technic axles is one of these, because determining their length is not always that easy. Well, now it is. Second scenario is measuring distances and locations over baseplates and other large LEGO plates. The ruler not only tells you how many studs there are in a given place, it also keeps you in a straight line. Because stud distances are measured using the studded bottom edge of the ruler, you can simply grab the ruler with your hand, keep it in a vertical position and move it over the baseplate, clicking in place where you want a measurement. This is helpful when measuring coordinates over baseplates. Above: The ruler demonstrating all of its four functions. 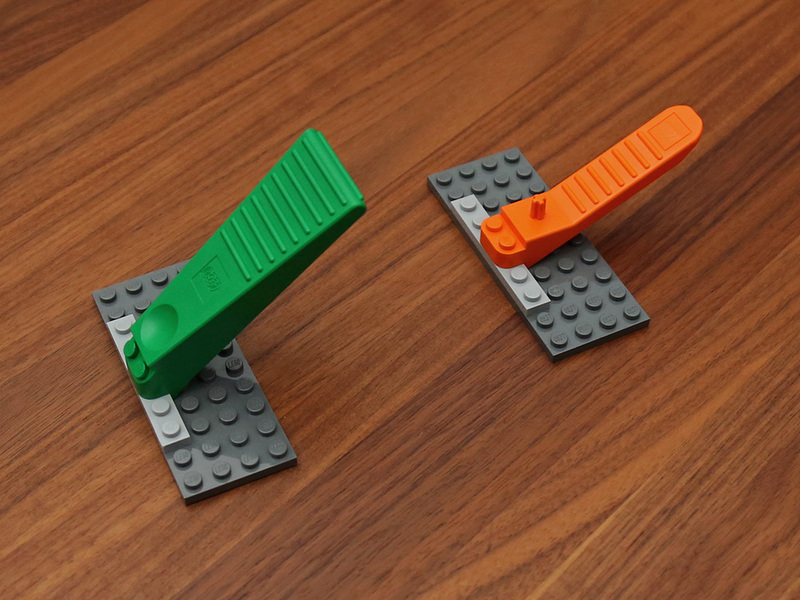 The green brick separator is the predecessor to the current orange brick separator and from what I can tell replicates the form of the original grey brick separator of circa 1992. Thus the shape differs quite a bit from the new, diminutive orange brick separator. Compared to the orange one, the green tool is much larger and sturdier in hand, stands at a steeper angle and thus feels like (and probably is) putting more force into twisting the brick loose. Because of its steeper angle, green can also fit into a tighter space on a plate, although the wider handle means it needs more operating space upwards compared to orange. 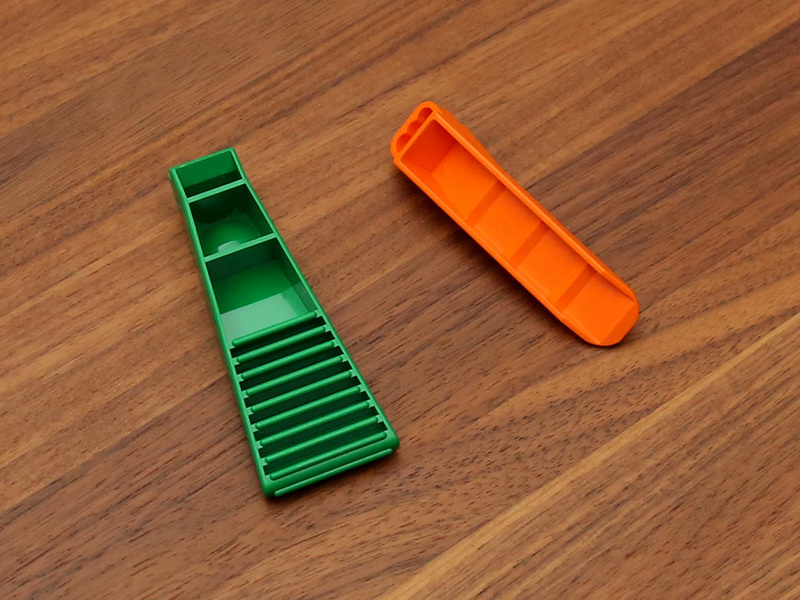 Above: Set’s green brick separator (left) and the new orange separator (sold separately). Actual brick separating works well in both the green and newer orange versions. You can connect to both the top and the bottom of the brick/plate with both separators, allowing the use of two separators to split really stubborn cases – the green and orange separators even work fairly well together. You can get a slightly better grip of the green separator (it also has a nice recessed circle for your thumb) and it does twist a little more forcefully, but both get the bricks out. Green does lack two functions of orange, though: the orange brick separator can remove Technic axles using its small axle stub as well as better pry out studless flat tiles using its thin end. Overall, I’d say the new orange brick separator is more versatile and thus better than the older green separator that is included in the Designers’ Tool Set. However, simply for twisting a brick or plate loose, green does fit your hand better and can twist harder. But green is also a much tighter fit when placed on plates, meaning it can dent the studs next to it a little, at least when new – orange does not. Orange is gentler, green is more brute. I can see why some prefer the green one (especially people with larger hands), but orange is definitely the more balanced product. Orange also saves you a little space. Above: Back of the green (left) and orange brick separators. I like the Designers’ Tool Set, although if you are going to get this and don’t have a brick separator already, try to source a second brick separator (any color) too, since some cases benefit from having two separators. If you only want to spend money on two brick separators or one Designers’ Tool Set, get the pair of separators, they are far more useful than a ruler. Danish price comparison: One orange brick separator is 19,95 krone, the Designers’ Tool Set was 49,95 kr (roughly 7 euros/8 dollars). I think the set may be on its way out since the online LEGO Shop no longer lists it, so act quickly if you want one – at least Amazon.com seems to be able to point to a few online sources. As for me, I will now approach all my future building with an arsenal of four tools: two orange brick separators, one green brick separator (I will use the one that fits the situation best, meaning mostly orange) and the red ruler for measuring axles and longer distances over plates. At this rate I’m going to need a LEGO toolbox, though.